MBA’s Banking Leadership Missouri is an 18-month leadership development program designed to actively enhance the leadership, organizational and performance skills of highly motivated mid- to upper-level bankers. The program establishes a network of future bank leaders who understand and can respond to local and national issues affecting the banking industry and their communities. The program is practical, hard-hitting and quality-driven. We will focus on developing a solid understanding of the industry and the skills necessary for leadership that participants can put into practice immediately. Every two years, a class of up to 25 Missouri bankers is selected to participate. To identify, develop and involve the future leaders of Missouri banking. Goal: Increase young banker involvement. Objective: Prepare participants to be leaders in their industry, community and the Missouri Bankers Association. Goal: Provide quality banker education. Objective: Enhance and develop leadership, communication and political action skills. Goal: Identify future leaders of Missouri’s banking industry. Objective: Motivate, energize and establish a network of bankers who will serve as leaders of the Missouri Bankers Association. High-potential, upper level bankers who have or are preparing to take on broader responsibilities; bankers who have experienced or will soon undergo the transition from a functional to a general management role; bankers who have potential for senior management. Applicants must submit a completed application and a letter of recommendation from their bank. Tuition for the MBA’s Banking Leadership Missouri Program is $2,775 and is payable at the beginning of the program. Tuition covers all seven sessions, workbook materials, instructor fees and limited meals (continental breakfast and receptions). Tuition does not cover overnight accommodations and transportation costs. Attendance at all seven sessions and MBA selected scheduled programs is required. Enrollment is limited to 25. Applicants must submit a completed application by Friday, April 26, 2019. Candidates will be selected by the MBA Executive Committee. Participants will be notified no later than Friday, May 10, 2019 of their status. The Banking Leadership Missouri Program is a practical, hard-hitting program. Each session will concentrate on an area of successful business operation. We’ll focus on developing a solid understanding of the industry and the skills necessary for leadership that participants can put into practice immediately. Members of the Banking Leadership Missouri class will be introduced to MBA members at the annual convention in Branson. Attending the convention gives BLM participants the opportunity to become acquainted with each other, as well as the leaders of the banking industry in Missouri. Internal and external communication is at the core of strong leadership. Leaders must understand that communication is the key to everything — from building high-performing teams to engaging in critical conversations to delivering successful presentations. Unfortunately, if you ask employees at many banks what they would like to see from their leaders, you’ll also hear one resounding answer: more communication. In reality, the solution is often not that they need more communication but that they need better communication — driven by strategic leaders who know how to connect the dots from transparent, feedback-driven communication practices to business impact. Class members will get an in-depth look at the legislative process both in Missouri and the federal level. Briefings by state legislators, lobbyists and regulators will explain how bills become laws and the impact those laws have on the banking industry. Discussions will also include the banker’s role in government relations, the effectiveness of MBA grassroots programs and the structure of MBA political action committees. If the schedule permits, a tour of the Missouri Capitol is planned. Great organizations need people who can collaborate with their team members, sell their ideas and sustain great relationships with their clients. This engaging session of interpersonal insight is immediately applicable in many business management, communication and relationship situations. It is a dynamic and interactive program that will give you tools to build more productive relationships with your clients, direct reports, peers, team and other key business relationships. The class will be briefed on specifi c issues facing bank leaders currently and looking to the future. Specific topics will be determined by the banking environment leading up to this session. Great managers are often identifi ed by their ability to consistently drive strong business results. Although that quality is critically important for a bank’s long-term success, it falls short of defining a great leader. Great leadership extends beyond purely quantifiable metrics and into the murkier world of ethics. The ability to act with a coherent and strong set of values day in and day out — no matter the context — is incredibly challenging, especially when acting with ethics may mean making unpopular business decisions. This is particularly true in banking where almost every decision requires that we think about ethics as much as we think about numbers. All great leaders know their personal code of ethics — how they will act and how they expect others to act — and they don’t shy away from them. Instead, they make their ethics an integral part of the way they build their teams and businesses. The Banking Leadership Missouri program concludes December 2020 at MBA’s Executive Management Conference in Kansas City. 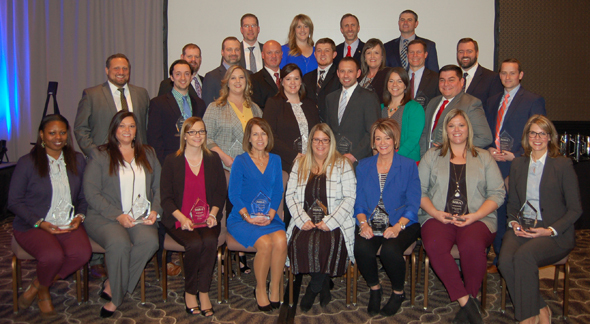 Class members will participate in the general and special interest sessions with leaders in Missouri’s banking industry and will be recognized at one of the conference’s general sessions. Participants are required to attend MBA’s regional meeting in 2019 and 2020 as part of the Banking Leadership Missouri curriculum. Regional meetings are scheduled in August and/or September. Banking Leadership Missouri participants attending the Young BAnkers Leadership Conference in October 2019 and October 2020 will receive a $75 discount. Contact John Allen at MBA at 573-636-8151.